Despite reporting a healthy 20% increase in net income for 2017 to $15.9bn (£10.5bn), Facebook reported declines in user numbers and usage time. Further, time spent on the platform dropped by 50 million hours everyday, or 5% of total time spent. But the social media network's advertising revenue is still growing strongly at 49% for the financial year, taking in $39.9bn. Founder and chief executive Mark Zuckerberg attributed these declines to the changes made on the platform, such as its alteration of the newsfeed algorithm: "Already last quarter, we made changes to show fewer viral videos to make sure people's time is well spent. In total, we made changes that reduced time spent on Facebook by roughly 50 million hours every day. By focusing on meaningful connections, our community and business will be stronger over the long term." The trending decline in user numbers, however, may predate the changes Facebook instituted. Pivotal senior research analyst for advertising, Brian Wieser, noted that these trends had been spotted previously based on data from Nielsen’s digital content ratings product. "GDPR in Europe could impact user levels as well (presuming that Facebook would limit use to consumers who do not provide appropriate consent to share their data)," he further speculated. Facebook’s drop in DAU within its heartland was offset by growth in India, Indonesia and Brazil. In total, DAU the fourth water was 1.4 billion, up 14% year-on-year. This number is 66% of the platform’s 2.12 billion monthly active users in the quarter. Facebook’s awareness of the problems the company is facing and their hands-on approach to dealing with them, even at the cost of short-term revenue, should be viewed positively in a long-term context, Wieser said. Nevertheless, the platform's shares dropped by about 5% in the hours immediately after the announcement but have recovered since the markets reopened. "No doubt investors stared at the notable slowdown in daily user growth, which highlights just how important it is for Facebook to strike that delicate balance between staying true to users and encouraging quality content with continued monetisation," David Barker, managing director and senior vice-president of Amobee EMEA commented. Going forward it will be interesting to see how Facebook will advance its video platform and position it as a challenger to YouTube this year, Barker continued. "If there’s anything Facebook can learn from Netflix (which just earlier this week announced its best-ever quarter in user subscriptions and impressive earnings) is that there’s nothing like quality, original content to acquire new users and capture time spent on the platform. Facebook has fingers in a couple of jars at the moment (What's App, Instagram, Oculus), but the momentum of its video offering is definitely one to watch." Facebook’s revenue jumped 47% to $40.7bn in the past year versus 2016. Of this, 98% or $39.9bn was from advertising – a growth of 49%. In the final quarter, the platform’s ad revenue grew 48% year-on-year to $12.8bn. During the earnings call, Facebook chief operating officer, Sheryl Sandberg, shared that mobile-first video represented half of the platform’s video ad revenue in the fourth quarter, compared with 41% in the third quarter. "In 2017, mobile conversions continued to accelerate. Data from 17 markets shows mobile accounted for 69% of online conversions on Black Friday and 64% on Cyber Monday," she said. "It also drove 80% of conversions on Singles’ Day, a popular day for online shopping in China and increasingly other countries. Big shopping days like these are the kind of global events that Facebook and Instagram are uniquely positioned to support." Sandberg also said that Facebook was working on improving the optimisation of ads placed on Facebook. "We’re continuing to invest in Value Optimization, which helps advertisers show their ads to people who are likely to spend more with them. We’ve been gradually rolling this out to advertisers using Web Conversion, Dynamic Ads and Mobile App Install ads." So far, the early results are promising, she said. "Over 2,500 businesses have tried Value Optimization since June and many are putting more of their budgets toward it." 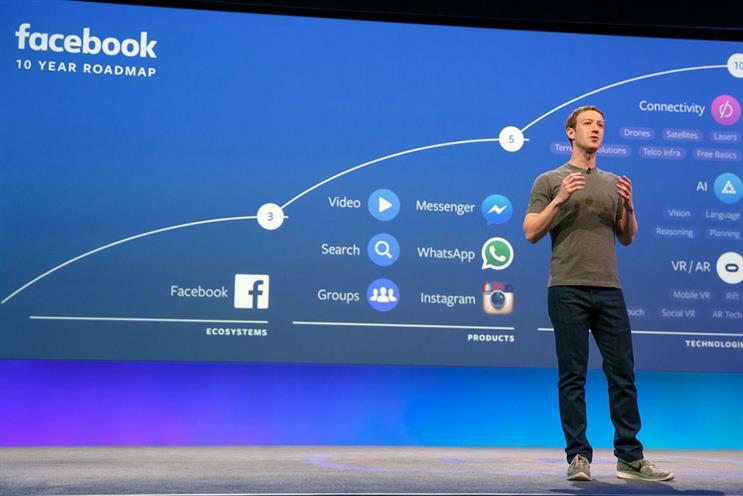 Of the changes Facebook is making to the way it is used, marketers are confident that any concerns can be offset by the platform’s scale and utility, Wieser said. At an event yesterday organised by We Are Social aimed at discussing the newsfeed algorithm changes, speakers, which included Rich Burgess, social media manager, Audi UK and Lauren Davey, head of social media & display at Barclaycard Business, were confident that Facebook would still work for great brand content. "It is also a chance to shift focus from the main platform to Facebook’s other properties, such as Instagram and Messenger," Burgess pointed out. Basically, the changes to the algorithm, and the decision to ban Bitcoin ads, are Facebook’s attempt to clean up the user experience, Leo Ryan, vice-president of customer success EMEA at Spredfast, said. "Just don’t do crap." Zuckerberg elaborated on Facebook’s announcement that it would be asking its users to rank news sites in terms of trustworthiness. "The second update we announced is about making sure the information you see on Facebook comes from broadly trusted and high-quality sources, in order to counter misinformation and polarization," he said. The goal is to decrease the "bubble" effect, by showing more news from sources that are broadly trusted rather than allowing communities to be isolated by only reading the news they trust. "For example, take the Wall Street Journal or The New York Times. Even if you don't read them or don't agree with everything they write, most people have confidence that they're high quality journalism. On the flip side, there are blogs that have intense followings but are not widely trusted beyond their core audience. We will show those publications somewhat less." he explained. Using AI, the platform has been demoting false news in the News Feed, typically dropping the article’s traffic by 80% and "destroying" the economic incentives behind generating these false articles, he said. Facebook will also be investing in people and technology to "protect the security and integrity" of its platform, Zuckerberg continued. "We now have around 14,000 people working across community ops, online ops, and our security efforts. That's almost double where we were a year ago," he said. Finally, Facebook is introducing an "ads transparency" programme. "We've already begun launching a way for anyone to view the ads a page is running on Facebook, Instagram, Messenger — even if they aren't the intended audience. We're testing in Canada first with the goal of rolling it out in the US this summer ahead of the midterm elections," Zuckerberg concluded. While Facebook doesn’t break out revenue figures for its different platforms, some insights were shared during the earnings call. Instagram has been growing, Zuckerberg said. "There are more than 2 million active advertisers on Instagram and we announced in November that more than 25 million businesses have profiles on Instagram – up from 15 million in July." While highlighting Facebook’s renewed focus on small businesses, Zuckerberg said around two-thirds of visits to Instagram business profiles are from people who don’t yet follow them. "This is how many businesses are finding new customers." Videos are also working well on Instagram Stories, Sandberg shared later. "Sixty percent of these ads are viewed with sound on". Facebook is also working on ways for businesses to communicate with customers on Messenger and WhatsApp. "We launched a plug-in for Messenger so people can chat live with companies on their websites, and now more than 2 billion messages are sent between businesses and customers every month," Zuckerberg said. He added that WhatsApp has recently crossed 1.5 billion monthly actives, with people sending more than 60 billion messages every day. "A growing number of these messages are between people and companies, which is why we launched WhatsApp Business — a new app designed specifically for small and medium businesses to connect with people they want to reach," he said.